Earlier in the summer when I photographed my family room for my Home Tour, I snapped a few pics of my foyer at the same time. With so many gloomy rainy days, it was a challenge to get a day of decent lighting, so I seized my moment! I’m sharing them today, even though they’re not the best quality. Think it’s time for a better camera and maybe a photography lesson or two? 🙂 I’ll be adding to these as lighting and photography savvy allows. My foyer is small, but it functions well. The rug was my grandmother’s, procured during my grandparents’ time spent stationed overseas in the 1930’s. I used it as inspiration for my front door color, in fact, and you can read all about that here. From this view, the stairs are on the right, the dining room to the left. 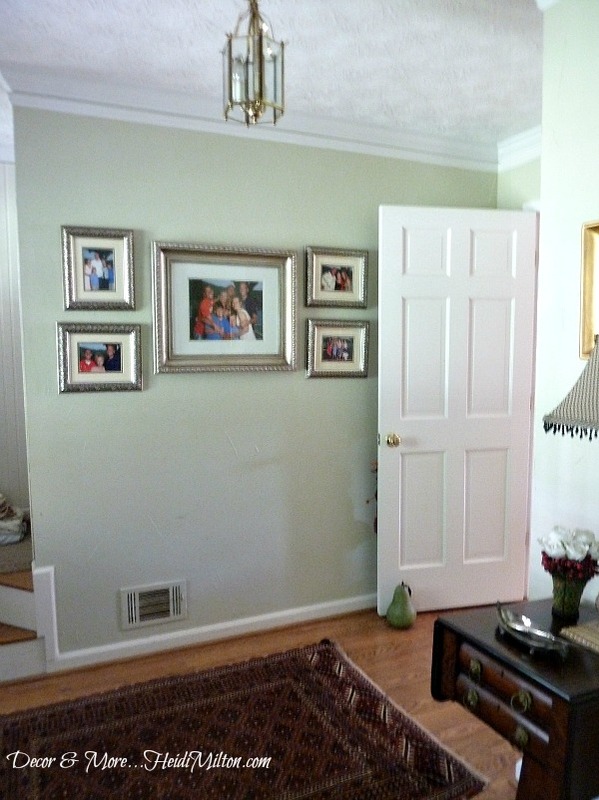 The little cabinet to the left of the door is a music cabinet I scored at Scott’s 14 years ago. It’s a pretty and very versatile piece, storing everything from sheet music to scrapbooking supplies, to extra light bulbs. 🙂 The painting above was done by my great-grandmother. I love it, though, it’s very “old fashioned”. My grandmother selected the frame long ago and I don’t have the heart, or truly even the desire, to change it in any way. You can see my dining room opens off that side of the foyer. 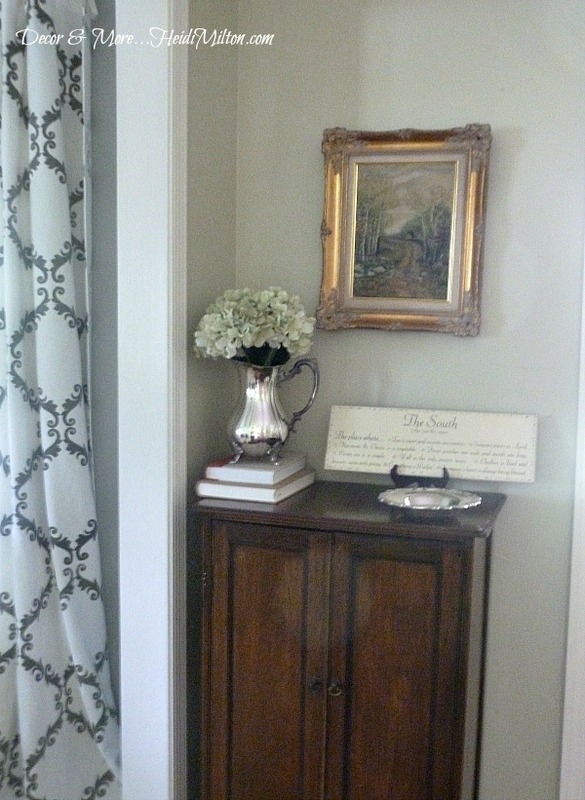 Still in love with those stencil drapes (get the low down HERE)! If you turn from the dining room entrance to the left, you see this little area, which you’d also see as you come in the front door. I can see I need to rephotograph this so the lamp cord is disguised. 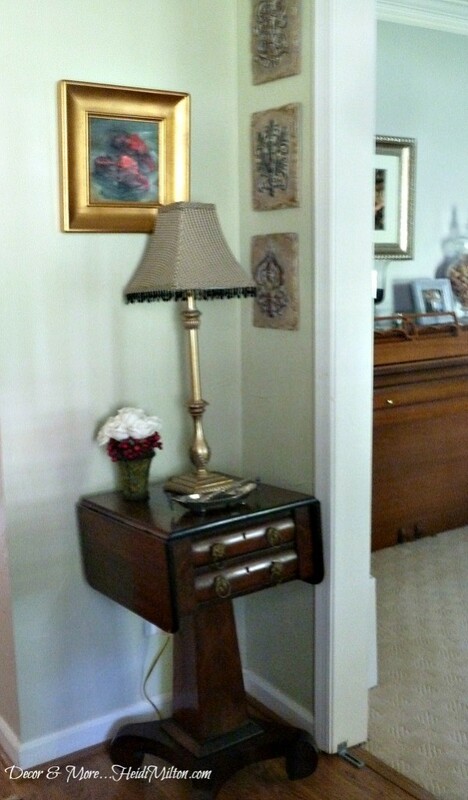 The little drop leaf table was another of my grandmother’s pieces. One of the back legs actually needs a little repair, so I’ve got that on my To Do List. The lamp has been around for a long time and I’m still happy with it, though I think I might update the shade soon. The painting above was my first major art purchase. I got it from a gallery in Santa Fe, NM some time ago and it’s called Scarlet Ladies. Somewhere I have a better photo of this, so I’ll update this when I find it. The door on the left leads into my kitchen. When my kids were small and we had dogs, I loved being able to close off the front part of the house so they couldn’t get to the stairs, dining room, or front door. 🙂 But now that we’re way past that stage, I’m thinking of removing the door and maybe even opening that up completely. Just thinking. I’d also love to update that light fixture and scrape the ceiling smooth. My To Do List is growing. You can also see my meager attempt at a gallery wall. These are photos from our big day, when we took the plunge and blended our crazy crew. I put these up 7 years ago and would love to update this. 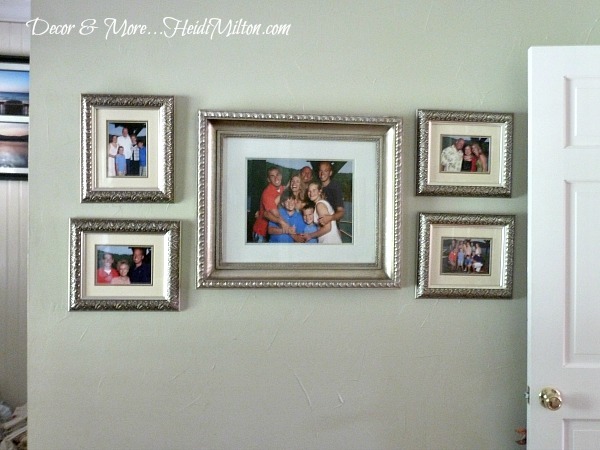 I like the frames and they blend well with the other artwork in the foyer, but I leaning towards some simpler frames in metallic tones. You can see that if I were to remove the door, I’d have lots of room to add even more photos. I’ve often looked for a narrow console table to put on this wall, but it’s such a narrow passageway to the stairs, I really think it would be way too crowded. Instead, maybe the gallery wall should encompass the entire wall. I’ve got some cool things I’d love to integrate somehow. Stay tuned! We’re off to the lake for a breather this weekend, since the sports and activities haven’t quite kicked in yet. Plus, it’s supposed to be sunny! Hope I can actually find my sunglasses, since they’ve gotten very little use this summer. 🙂 Follow me on Instagram and you’ll get a glimpse or two of lake fun! love it! so cozy and i LOOOVE that rug! Beautiful. I love the art from your grandmother. Enjoy the lake! Heidi your foyer is gorge! And I love all the sentimental pieces! THAT is what makes a house a home. Have a great weekend…we were hoping to take the boat out but it’s supposed to be rainy. Ick! Take some new plunge photos of the crew at the lake this weekend and add them to the gallery. Beautiful foyer Heidi…and love the wall color! 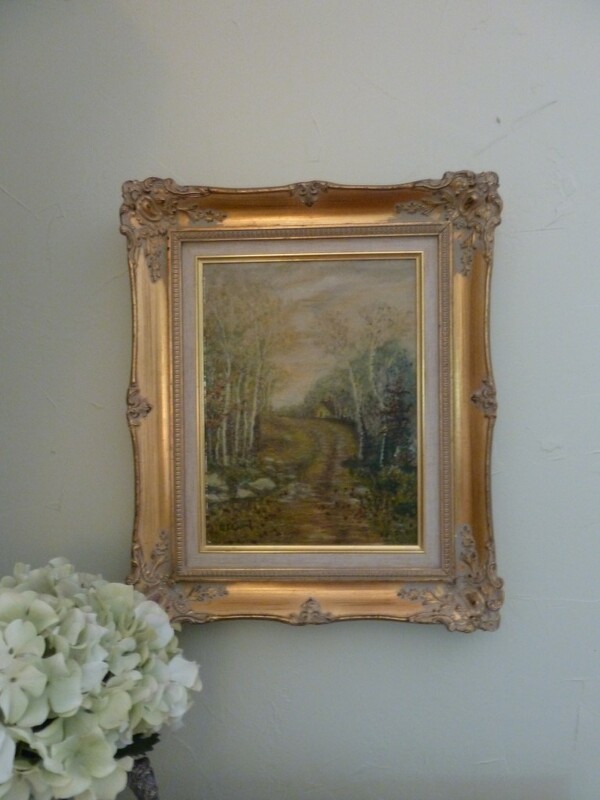 !…and love your “first art purchase” I hear that Santa Fe has the most incredible art!…. 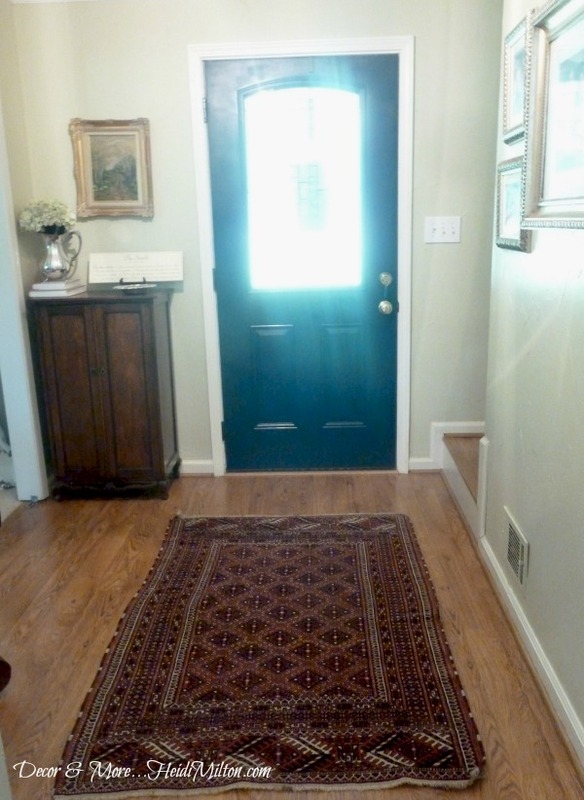 That rug is so awesome, and I love the tie in to your door color!! That music cabinet is awesome, too. Great potential.